Strategy, Customer Understanding, Design Measurement, Governance, and Culture. McDonald's and DD+D " Working Together"
at the 2012 Compete Through Service Symposium, at the Ritz-Carlton, Phoenix A.Z. this month. The Presentation:"Showing Customers (and Employees) We Care"
McDonald’s Chief Restaurant Officer has a favorite saying, “It’s not real until it’s real in the restaurant.” The path to making service experience real at McDonald’s has had many twists and turns and is still in its early days as a formal practice. We’re excited to share how service culture has been cultivated over the years at McDonald’s and how we’ve employed tools from the disciplines of theater and design and are collaborating with innovators in the service design community to have a positive impact on our business. And it wouldn’t be “real” if we didn’t have an embodied employee persona performance thrown in for good measure! Showing Customers (and Employees) We Care McDonald’s has worked hard to adopt a service innovation culture. They do this by utilizing a theatre of service design. They make service design real through brainstorming, modeling, and then simulation testing. They measure the value of service design changes and continue to move service design forward. With each new service design change, they get feedback from real employees on new innovations. The Experience Design team started as three people in the customer experience division. The division utilizes a number of out-of-the-box methods to help employees continually improve the customer experience. For example, employees go to an improv coach to learn different ways to greet the customer, give them their order, and generally interact with the customer. The video below "Working Together" is an example of what we're helping McDonald's (US and Global teams ) work toward. A great customer and Employee experience! Byron recently lead a Services Theatre and Branding workshop for Columbia College’s Packaging Design Class. The primary goal of this course is to gain an understanding of the process of Packaging Design as it relates to both graphic and structure. All of the students projects are developed in the context of a brand (either new or existing) and are created to fulfill a user need or a specific marketing objective. Dr. Stephen Grove and Dr. Mary Jo Bitner was used as the foundation of the workshop. "It helped us understand our project more than just researching it." " I really like how we went through different brands to compare them in their services"
"The exercises really enabled us to understand the barns and the consumer needs for the brand." "The enthusiasm really kept my attention and kept me interested." "It invited you to become a part of an interaction. It was entertaining and because of that , it made the information easier to absorb and remember." "It was very helpful to hear the presentation the comparisons to theatre really helped me to see the situation of buying service or a product in a different light. Also the feedback after the acting section helped me see things that I was portraying about the brand subconsciously." It's a good method to connect to the company and the client." "Fun, interesting , and helpful!" My article, "Call Me a Cab! But first…” -- which discusses principles and techniques drawn from Method acting and diversity and inclusion training can benefit service designers.-- was published in the latest issue of the Service Design Network's Touchpoint Journal. Touchpoint Vol. 4 No. 2 focuses on the connection between service design and the performing arts. Services and performing arts have many things in common: both are ephemeral, made up of processes, depend on people to fulfill a variety of tasks which add up to a bigger picture, and both are planned with the help of tools such as storyboards, scenarios and customer journeys... In this issue of Touchpoint the main goal is to have a look at those processes which can be applied or transferred from the one field on to the other. Service Design and User Experience: Same or Different? What are the differences and similarities between Service Design and User Experience? This video does an excellent job of answering this question. Byron taught the "Ready" sessions of this year's Ready, Set, Go program at Northwestern University . Ready, Set, Go is an intensive summer workshop designed to improve the oral communication and presentation skills of graduate students in science, technology, engineering and mathematics. Get Ready: Build stage confidence through improv and theater. Get Set: Learn to customize your research story for any audience. Go: Showcase your skills in an interdisciplinary colloquium. The Northwestern program is modeled after a program originated by Stony Brook University's Center for Communicating Science where Alan Alda (Mash) ran the "Ready" section. Here is a video of his work which I adapted for our program. DD+D Goes to Helsinki Finland! Byron has been invited to present an interactive lecture as part of World Design Capital Helsinki 2012 events. The presentation is June 7th. 2012 in Helsinki. The presentation is titled,Theatre + Design. The audience will be a mix of SME-small business owners, designers and improv actors from Helsinki's Stella Polaris improv troupe. The actors will perform as part of the presentation. The event is funded by TEKES Funding Agency , Finland. The way we go about creating new products and services is changing. There is a move to focus on the customer-centric or human-centric aspects of design. This change, along with increasing complexity in available technologies and experiences, make it imperative that SMEs’ and designers have an empathetic perspective. Customers compare companies – no matter what industry they are in-against firms like Apple, Southwest Airlines, and Disney that are known for customer centricity. As a tool for modeling human interactions, theatre is inexpensive, fast and flexible. Theatrical techniques and acting methodology can help support building that empathetic perspective when infused into the design processes and aligned with business goals. The Theatre + Design lecture will review what’s needed for SME’s, design firms, and theatre + based design consultants to work together to create business value and great customer experiences. Byron will also be a guest participant at the Fennia Awards while he's in Finland. 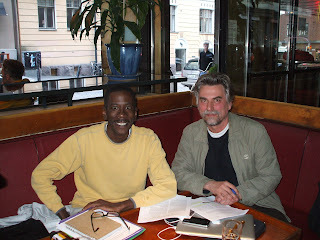 I had the opprotunity to meet Vessa Kantola while in Helsinki. Vessa has been a leader in the area of theatre and design. DD+D will be one of the speakers for this month's IxDA event -"Personas and Prototyping" at SymphonyIRI Group. What makes a persona useful? What are your expectations for them, and how do you prepare your team so they function? How much research is enough? How many personas do you remember? Are some of them like stock photographs, and others like a Weegee news photo? They are a waste of time & money if they are not memorable; your clients should be able to refer to them by name sooner and later. Charles will share some strategies & examples of paper personas that worked, Byron will talk about work with McDonald's and embodied personas and may demonstrate. Shailesh will talk about techniques he used to quickly understand the users of Air NewZealand's Economy SkyCouch. Great video on design especially Service Design! Please take a look and let me know what you think. Is this possible is the U.S.? DD+D will host the Chicago Service Jam again this year! On Friday February 24th, people in nearly 50 cities around the world will be getting together over 48 hours for the second Global Service Jam. Working with a shared theme, we will design and rapid-prototype services. It will be a chance to learn more about service design and service design techniques… by ‘doing’. We’ll be uploading the results onto the Global Service Design HQ Hub… and all the designs will be presented to the world! The Chicago Service Design Jam Host Byron Stewart invites Chicago area non-profit professionals, designers, marketers, managers, researchers, creatives, entrepreneurs, academics, and students to participate in this global experience. Come work with and learn from our amazing Team of Design Coaches and from each other. Want to learn more about Service Design? Want to practice your service design skills? Then this Jam is for you! Host Location: We are proud to announce that Northwestern University’s Segal Design Institute and Design For America are sponsors for the Jam and will be providing our Jam space for the weekend. Space for only 20 participants. I recently completed reading, and this is Service Design Thinking and had pleasure of meeting one of the editors Marc Stickdorn at the Service Design Network Conference'11 (he was also a presenter at the conference). We talked about the use of theatre in the field of service design . With chapter sections titled "What If..?" and "Service Staging" Marc's book explores the use of and place for theatre in this new field of service design. Here is a very comprehensive review of the book we found. This book is a must read for anyone interested in service design. “This Is Service Design Thinking… is likely to become the quintessential service design textbook for students, educators, and professionals alike.”If you’re like me, you have a mini-library of those user experience books that are most meaningful to you. No, not the ones hidden away on your eReader, reminding you of their presence only when you see their titles on the screen. Rather, I’m referring to those tangible books, sitting on your office bookshelf or on a side table at home. Perhaps some remind you of the time when you first entered the field of user experience, wanting to absorb everything about the topic. Or maybe everyone raves about a book as being seminal to the user experience discipline, but you keep the fact that you’ve never read it a secret. Regardless of why you have them, where they live, or how much you recall of their content, these books are important to who you are as a UX professional. Defining Service Design: Establishing a 5-Principle Framework“Service design truly is an amalgamation of disciplines, including product design, graphic design, operations management, and, of course, interaction design.”The authors of This Is Service Design Thinking refreshingly call attention to the fact that no concrete definition of service design exists. Instead of attempting to summarize service design in a neat, mission-statement-like paragraph, Stickdorn and Schneider show how service design truly is an amalgamation of disciplines, including product design, graphic design, operations management, and, of course, interaction design. Service design does not pretend to be the new kid on the block—different from everything that’s come before. On the contrary, service design relies on various existing methods, tools, deliverables, and processes, as well as the expertise of many in these interdisciplinary fields to do it right. “Services should be user centered. … This first principle is where UX professionals can influence the field of service design the most. Considering the customer is fundamental to any work we do.”Sequencing is the visualization of a service “as a sequence of interrelated actions” and documenting the individual process steps and touchpoints that comprise a service experience. Evidencing is the visualization of “intangible services … in terms of physical artifacts.” Evidencing makes visible to customers the elements of a service that help them to proceed optimally through the service experience, appreciate the intricacies of the service and exhibit loyalty. The authors use the example of the folded toilet paper in hotel rooms as an example of subtle, but effective evidencing of a hotel’s housekeeping service. Who are service designers?What is the process that service designers follow? Who Are Service Designers? “Professionals leverage their own unique discipline to provide the necessary perspective to address a service-related problem….”In their book, the authors leverage articles that subject-matter experts from seven different disciplines have written: product, graphic, interaction, and social design; strategic and operations management; and design ethnography. And they admit that their list of disciplines is not exhaustive. Each article details a point of view (POV) or case study that illustrates how a discipline contributes to service design. The phrase contributing to is critical; people in these diverse disciplines do not claim that they should necessarily own the full set of processes, activities, and deliverables of service design. Rather, these professionals leverage their own unique discipline to provide the necessary perspective to address a service-related problem at hand. For example, graphic designers may develop an intuitive wayfinding and signage system to support visitor navigation at a trade fair, or product designers may work with an elevator company on concepts to help improve the efficiency and flow of people in a shopping mall. Future Service Designers“Service design is in its infancy as a discreet discipline, and applications of it beyond academia are only beginning to surface.”While service designers can impact services from a bottom-up, contributory perspective, the unfortunate truth is that impacting services from the perspective of top-down accountability in an organization—whether strategically or operationally—won’t be easy. The Service Design Process and Tools “The service design process … is …meant to provide an overall framework within which service designers can work, but allow significant flexibility for iterative problem solving and the creation of multiple design concepts.”Using the words process and tools may imply some rigidity in the approach service designers use in their work. On the contrary, the service design process that the authors outline is high level and fluid by design—and meant to provide an overall framework within which service designers can work, but allow significant flexibility for iterative problem solving and the creation of multiple design concepts. Using tools to define a service design solution quickly and obtain an answer is less important than choosing a process that allows rigorous and validated exploration. The questions are what is key. Stage 1: Exploration The first phase in a service design project involves understanding the culture and organization from the perspective of the customer, identifying the real design problem at hand through various tools and ethnographic approaches, then visualizing your findings and making service issues and opportunities real and tangible, so you can tackle them. Stage 2: Creation After problem definition and insight gathering, the creation phase begins with service ideation and concept generation. As the authors humorously describe, service designers love their Post-it notes, primarily because of how they allow iterative, quick thought processes to flow. The creation phase is when you want to be exploring as many potential mistakes as possible rather than trying to avoid them. And you want to involve all groups of people who are part of the service experience in the creation process, including customers, stakeholders, and employees. Stage 3: Reflection “What’s challenging about service design—as opposed to digital or product design, for example—is prototyping a service experience and all of its nuances effectively.”During the reflection stage, you evolve your visualized concepts from the creation phase, in the form of prototypes, and test them. What’s challenging about service design—as opposed to digital or product design, for example—is prototyping a service experience and all of its nuances effectively. For example, imagine trying to prototype the service interactions of a pharmacy experience, ensuring that you include all of the elements that are critical to effective service design. Merely providing customers and employees with a brief concept description or storyboard simply won’t do the whole service justice. Instead, service designers use practices and artifacts from the theater—scripts, role-playing, props, scenery—to create as realistic a service design prototype as possible. Stage 4: Implementation Implementation in service design is less about building an application and more about the change management that is necessary for people to effectively introduce and operationalize a redesigned service. The keys to effective service change management are having included the same people throughout all of the earlier stages socializing the various service design deliverable and artifacts that help communicate the elements of the new service. Tool Highlights“While many [service design] tools are very similar to those UX professionals use to garner insights about a target audience and enable them to begin requirements definition, … they are broader in perspective and scope.”If you were to purchase This Is Service Design Thinking for no other reason, the crowdsourced and exhaustive set of service design tools it offers may be value enough. While many of these tools are very similar to those UX professionals use to garner insights about a target audience and enable them to begin requirements definition—such as personas, customer journey maps, contextual interviews, shadowing, and scenarios—they are broader in perspective and scope. How Is Service Design Really Different From Experience Design? “How service designers execute these principles and methods and the breadth of their potential scope and impact differentiates service design from experience design.”One could argue that experience designers follow the principles of service design—and use its processes and tools as well. If, as a designer, you do, and you’re achieving organizational and customer impact across all touchpoints, it doesn’t matter whether you call yourself an experience designer or a service designer—as long as that impact occurs. After all, service design has its roots in user experience and interaction design, among other disciplines. Parting Thoughts“The meaning of This Is Service Design Thinking extends beyond its covers and the ideas of its co-authors.”Through the lens of This Is Service Design Thinking, I’ve taken the opportunity to dive deeper into service design as a field. This book will likely become the go-to resource for educators, students, and professionals. Although I hope I’ve done its content justice, I’ve not yet spoken about the book itself as a manifestation of a service. The authors followed a co-creation process involving contributors, teachers, students, designers, and readers in its design. From evaluating good and bad textbook designs to crowdsourcing content to soliciting in-progress feedback on the book’s design, the meaning of This Is Service Design Thinking extends beyond its covers and the ideas of its co-authors. Much post-publication discussion, critique, and ongoing feedback continue. Similarly, I welcome future discussion about this column, to continue co-creating what service design means and exploring its synergies with experience design.